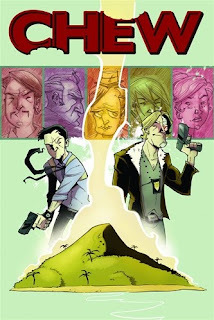 The second volume, Chew: International Flavor still follows that original equation, but grabs its inner Classic Marvel and jacks it up to 11. We’ve got cyborgs, we’ve got vampires, we’ve got a fruit that looks like the love child of a pineapple and an octopus and tastes like chicken. That’s just for starters. There is a lot of plot advancement here and a lot of questions get answered. The dynamic of the series has also shifted a bit with the treacherous Mason Savoy replaced by John Colby, Tony’s old Philly PD partner. Colby has joined the FDA after having cybernetic implants put in to replace the part of his face that was hacked off last volume. He’s requested not to work with Tony (surprise surprise) but their boss, Applebee -- who’s even more of a hilarious jerk here -- has paired them together anyway. Tony is upset at first, but we quickly learn that the two do in fact care about one another in a hilarious bit about driving (“You want me to get in a car with an Asian driver behind the wheel? I’d rather take another hatchet to the face, thank you very much.”) and a bit where John prevents Tony from having to eat crap (literally). This brings out a very buddy-cop vibe and I keep thinking of Starsky & Hutch whenever I read these scenes. The aforementioned scene with the poo leads Tony to discover the gallsaberry, the also aforementioned pineapple-octopus spawn. The thing about it is that when you cook it, it tastes like chicken. This leads Tony to the micro-nation of Yamapulu, where the plant is grown. He’s accompanied by his brother Chow, who’s taken up a job as a resort chef, seeing as how the island is famous for looking the other way when it comes to consuming chicken, which is forbidden in the Chew-verse. Of course that’s all changed now that the gallsaberry has shown up. By the way, that strange little man in a riverboat hat who showed up with a box asking for Amelia Mintz? His name’s Nomi Haupai and he runs this island. He’s got a big plan and it involves Ameila, the world’s best chefs, and the gallsaberry. He takes the villain role this volume and his efforts are the focus of the book. Mason is hardly mentioned at all here, except for a wanted poster in the background and a phone call another character tries to make to him. It's sort of a letdown that I didn’t get to read his wonderful dialogue again, but hey -- we get to witness a civil war break out on the island over a champion cockfighting rooster, so I guess that evens things out. Also, this time around we meet “The Vampire,” the guy referenced by the Russian woman last volume, and boy, is he nuts. Seriously, some of the stuff he pulls is downright shocking. Personally, I think he might be the third cibopath mentioned by Mason in Taster’s Choice but with a series like this you can’t be sure -- Mason proved that himself in the last book. But by far, the biggest surprise in here is just where the gallsaberry really originated, and we get to find out in another one of those brilliant grid drawings that Rob Guillory does so well. Guillory's art is great here, and it's easy to see why he landed a Harvey Award nomination for Best New Talent.